We’d love your help. Let us know what’s wrong with this preview of The Wild Blue by Walter J. Boyne. The novelized 'social history' of the U.S. Air Force. This book follows the fictitious careers and lives of members of the United States Air Force. 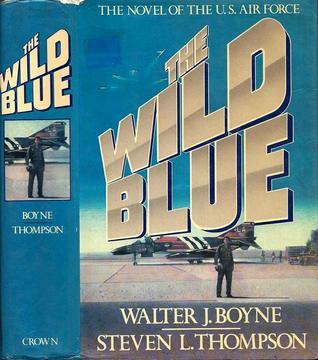 Published October 1st 1986 by Crown Publishers, Inc.
To ask other readers questions about The Wild Blue, please sign up. A unique take on the history of the US Air Force in the Mid-20th Century. Rather than offer a dry historical narrative, Boyne interweaves the disparate stories of 5-8 people from their enlistment through their end of service. The approach allows him to add color to the history and show how grunts, officers, and bureaucrats viewed the changes. I really picked up the book because the author is from East St. Louis, and I was expecting more on that city's wicked underbelly. But I was disappointed on A unique take on the history of the US Air Force in the Mid-20th Century. Rather than offer a dry historical narrative, Boyne interweaves the disparate stories of 5-8 people from their enlistment through their end of service. The approach allows him to add color to the history and show how grunts, officers, and bureaucrats viewed the changes. I really picked up the book because the author is from East St. Louis, and I was expecting more on that city's wicked underbelly. But I was disappointed on that point. Although he has two characters from the area, their only connection is getting out and staying out. There were only a few hints at the gangsters, gamblers, and prostitutes. Basically, five pages out of 600 described the city. I have read this book 3 times and it is an excellent look into the USAF from just after WWII till the middle 1980's. Although fiction it gives an accurate picture of what the Air-force must have been like to be in and the development of planes in that era plus the tugs and pulls of changes in society during those times. Great book. It's historical fiction. Made up characters, but based on the reality of the Air Force. It's a great way to read and learn about AF history. It starts just after WWII when the Air Force was first becoming its own branch and follows the careers and family lives of several different people from their entry in the AF through their careers in Vietnam, Korea, and after. The beginning of the book is fairly awkward. It starts out in present day at the funeral of one of the characters and the Great book. It's historical fiction. Made up characters, but based on the reality of the Air Force. It's a great way to read and learn about AF history. It starts just after WWII when the Air Force was first becoming its own branch and follows the careers and family lives of several different people from their entry in the AF through their careers in Vietnam, Korea, and after. I really wanted to like this book, but after 120 pages, I just couldn't get into it. Too many characters to keep track off, too much bouncing around between them. Dates fluctuated greatly, which was distracting. Like W.E.B. Griffin's The Corps series, it concentrated more on the personalities than battles and time in the cockpit, but wasn't nearly as well done. When I got to the point where I dreaded opening the book, I knew I was done. Interesting account of the first 30 years of the US Air Force, focusing on the careers of several very different airmen, and encompassing the Korean and Vietnam wars and everything in between. It's clear that the authors have tried to follow the model of story telling used in James Michener's 'Space', but they've done a great job of it. Would recommend this book highly to flying and history buffs. Couldn't finish the book. It was so boring that I lost interest. I struggled to finish it but couldn't get past pg 100. There were too many characters to keep track of and the author assumed that u knew a lot about the Air Force already. very good story despite all the major players and keeping them straight, great how blacks and women came to be in the history of flying !!! Even if this is a really long book, it is still a good book. I like the detail that the book goes into.